I think half of my wardrobe comes from Comptoir des Cotonniers. The French intepretation of easy relaxed and slightly boho casualwear suits my lifestyle to a T. I've often marveled at their incredible sales held twice a year. Well made clothes at a bargain which is practically unheard of in New Zealand. My favorite haunts are the branches at South Molton Lane or Kings Rd in London. However, if you prefer (like I do) great service, you'll chose the tiny store at South Molton Lane. As for the latter, their service is a hit and miss depending on who's working on the day. My major pet peeves when it comes to customer service are 1) the staff ignore you and continue to gossip as if you're invisible 2) tidying the store despite you calling out excuse me numerous times 3) bopping to the beat of the music and thinking how cool they are instead of serving the customers 4) busy admiring oneself in the mirror. 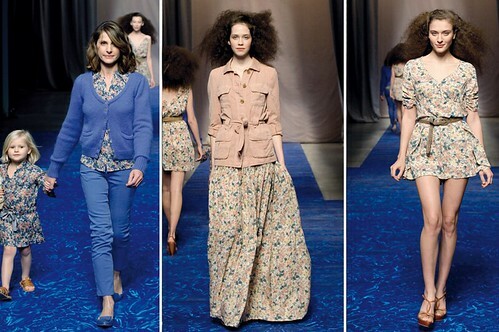 However, I love that they showcase mother and daughter fashion shows. Most of their models are normal people by which I mean that they're not 6 feet tall with 22 inch waist and weigh no more than 100 pounds. 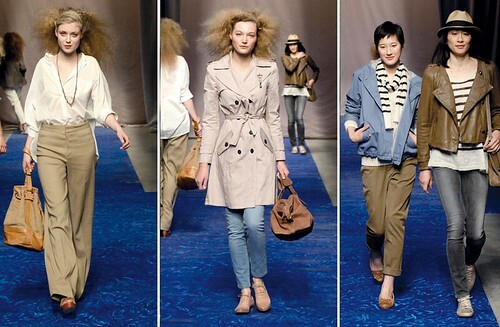 The new collection introduced the ubiquituous beige/camel trend which was made chic again by Phoebe Philo at Celine. To my disappointment, the colors are more muted which do not go well with my skintone. Nonetheless, I saw a few pieces which I'd love to get. My favorite look is the lady on the far right. Right now, I'm totally into the hat, leather jacket and striped top look. oh i love their clothes too! i fell in love with a beige skirt but i'm in between sizes so i reluctantly had to walk away. i went to both stores. do they have an online store? They're my favorite French high St brand. Definitely more reasonably priced than Zadig & Voltaire, Berenice etc. Unfortunately, they don't have an online store at the moment which is such a shame. H & M and Zara have just started selling online recently. I must have that striped top! I also love the little army green shirt dress for summer. My eyes went straight for the striped top but I need to practise a little abstinence after purchasing 4 in a row!! I want everything from this collection with the exception of the muted print top. what about the accessories? are they by C de C too? i love the pair of shoes in pic 5! dress (tt belt!!) in pic 10 is def me (or how i picture myself),dress in middle of pic 12 too (you get my style...) n right dress in pic 13 is how i would dress when 10, 20 years younger! Terri, if I'm not misaken, they sell the shoes, belts and bags too. Funny that, I never noticed their accessories until you mentioned about it. HAH! I've seen photos of you. You have a better figure than me! AND you look very young for your age. The great thing about C de C is that they design with both the mom and daughter in mind. oooo when are their sales? Their sale started last week.